"That only which a man produces by combining the materials presented to him or which he, to a certain degree, reproduces in his imagination until it becomes a part of his own train of thought,can be considered as a real acquisition; or can contribute satisfactorily to the development of his mind." Tonight at Clear Spring School we have our end of the year program called "the Celebration of the Child." I've been to about 18 of them since our attendance started when our daughter Lucy was in Pre-school. The Celebration of the Child is where visitors really see the depth of the school as each (and every) child is recognized for their very special gifts and qualities. Sometimes, when things are matters very much of the heart, rather than intellect, one finds difficulties putting into words an adequate description to do justice to an event. Perhaps the words in the title say enough, The Celebration of the Child. Join us in the celebration of the child. You need not be present (at Clear Spring School) to win. 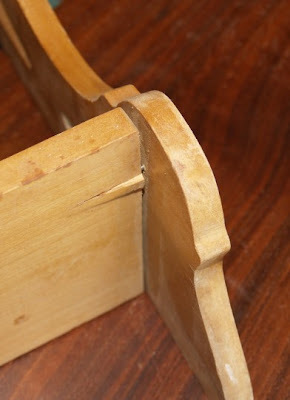 Richard Bazeley reminded me of this site for old woodworking books that can be viewed online. Chest of Books. The illustration at left is from William F. Klenke's Things To Make, Book One, the Home Workshop. It is from my small collection of old woodworking books, and Klenke is one of my favorite authors and illustrators from the early days. "The so-called banausic arts have a bad name, and quite reasonably they are in ill repute in the city-states. For they ruin the bodies of those who work at them and those who oversee them. They compel these men to remain seated and to work in gloomy places, and even to spend entire days before a fire. While their bodies are being enervated, their souls, too are becoming much enfeebled. More especially, also, the banausic arts offer men no leisure to devote to their friends or to the state, so that such men become base in relation to their friends and poor defenders of their fatherland. And so in some of the cities, especially in those which are considered to be strong in war, no citizen is permitted to work at any banausic craft." Obviously Socrates was liberally educated and knew very little about the joy one might find in exercise of creativity. About 40 years ago, I knew a blacksmith named Ted Reeser. His shoulders were incredibly wide and his arms were huge. He was proud of his physique and was very much aware of his attractiveness to (some) women. When he came into my father's store his skin and clothing were blackened by soot from the fire. He wanted me to guess his age. I knew him to be in his late 70's but I always guessed 60 just to make his day. He was nearly deaf from the ringing of his hammer and steel on anvil as he repaired farm implements and made tools. I know men like Ted are the kinds of human beings that Socrates believed had been deformed by their craft. But I suspect Socrates was living with his own set of deformities. Today we had a gap in the weather long enough for a second launching of the Blue Whale. 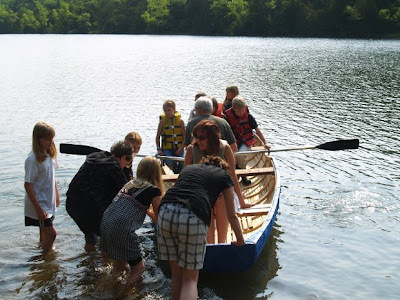 This time, the 1st through 6th grade Clear Spring School students had a chance to go out and enjoy being on the lake in a boat we made ourselves in wood shop. 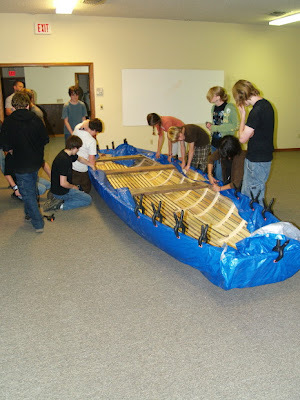 for more details on the boat, and to see photographs of various stages of construction, type the word boat in the search box at upper left. "Every growing boy and youth should learn to handle the recognized tools of the carpenter, as well as the ruler and compass. Mechanical dexterity would often be more useful than ability in gymnastics. The one helps the spirit, the other the body. 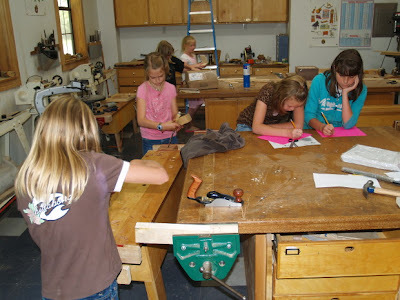 Elementary schools should have workshops, though they should not actually be technical schools. 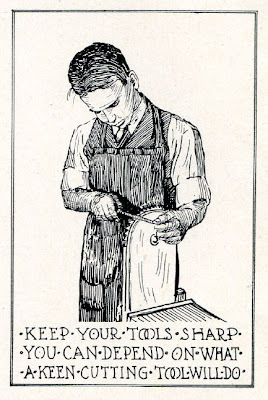 And every man should learn to use his hands. The hand holds the place of honor at the side of the power of speech in raising man above the beasts." 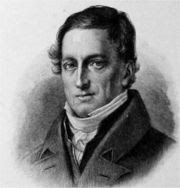 Herbart was a predecessor of Friedrich Froebel, and had not yet arrived at the understanding that the use of the hands advanced the development of intellect for all students. But he advanced the notion that all children needed the understanding that the use of tools and the hands could provide to the spirit. “He believed that every child is born with a unique potential, his Individuality, but that this potential remained unfulfilled until it was analysed and transformed by education in accordance with what he regarded as the accumulated values of civilization,” and it took the use of tools and hands to thus form his moral character. I want to thank all those who have come here through the New York Times link. One visitor raised the question that he believed Matthew Crawford's essay was in opposition to higher education. It is my premise that the hands are essential to the education of all students. There should be no line between the education of the hands and the education of the mind. The education of the mind alone without the contributions of the hands could reasonably be seen as a potential endangerment to human culture. It is called "being out of touch," and we can see the effects in our current banking and investment led economic fiasco. In other words, there is nothing wrong with higher education that the hands can't fix. On another slightly different subject, I went to get the oxygen sensor replaced on our Subaru this morning and the mechanic was complaining about the cars that are poised to put him out of business. The complexity of cars and their specialization of parts and repair procedures are making it very hard to compete with dealerships... Almost completely gone are the days of DIY. Of particular interest to my mechanic are the cars that no longer have dipsticks to check the automatic transmission. The conclusion we reached is that being engineered by virtual dipsticks, the real ones are no longer required. I can remember a time not very long ago when dash board lights were called "idiot lights," because they were there for the observation by idiots. People of a higher level of intelligence wanted real gauges because they were interested in observing such things as voltage and oil pressure. Back in those days, I had a small red Toyota pickup truck with a carburetor. When it quit on the roadside far from home one day, I got out my Swiss army knife, took the carburetor apart, cleaned it and adjusted the float. I will always remember the sense of accomplishment and confidence I felt. That simple experience might inform the reader of the means through which manual training and manual competence might affect the spirit of the individual. Have some doubts about all this? You can test what I am talking about in the laboratory of your own hands. Plant, fix, make, nurture, care, tend, sew, cook bake... there are lots of words (when put into action) that lead you, dear reader toward real growth of both intellect and competence. New York Times readers looking for the source of my quote in Matthew Crawford's article, The Case for Working With Your Hands can find it here on October 16, 2006. In the meantime, Woodworkers who use Danish oil finishes are left with the nagging problem, "How do I get this stuff off my hands?" Over the years I've tried a number of hand cleaners with some minor success. Now I've stumbled upon the miracle cleaner, one that it seems I will never need to buy at the store, and as long as I'm working with wood, will never run out of. Sawdust! I put a quart or two in the bottom of a small plastic trash bin and use it to scrub just like I would have done with soap and water. It is extremely effective, even removing the smell. After scrubbing thoroughly in sawdust, wash your hands as usual with soap and water. I am sure you will be amazed. 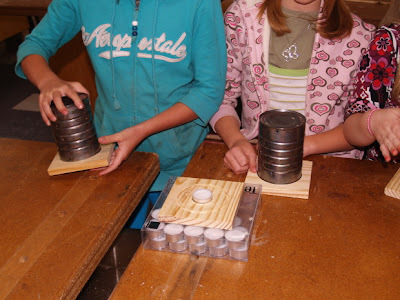 My students at Clear Spring School fussed about getting oil on their hands as they finished up end of the year projects last week. After discovering the effectiveness of sawdust at removing the oil from their hands, there were no further complaints and no hesitancy to get back at work on a second coat. I regard this simple thing as a major discovery. I would also like to welcome readers who have found their way here from the New York Times article by Matthew B. Crawford, The Case for Working With Your Hands. 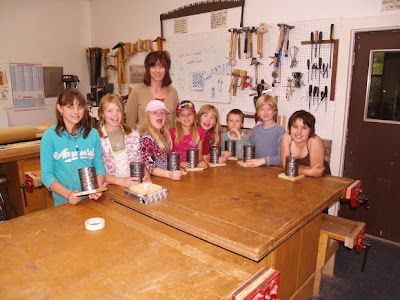 What you will find here are over three years of blog posts conveying insight on education, the role of the hands in learning, educational sloyd which set the benchmark for hands-on education, and documentation of my 8 years of teaching in my Wisdom of the Hands program at Clear Spring School. We all know that we learn best when our hands are engaged, but how do we do that effectively in schools? We are a model program demonstrating education as it must be if we are to be truly effective for the 21st century. Noted rocking chair maker, woodworker and crafts mentor Sam Maloof passed away on Thursday at the age of 93 according to this article in the Press-Enterprise . 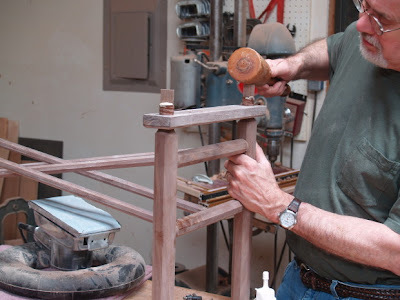 "I'm very pleased that I can still work," he said in an interview last year, talking while he built a chair. "I don't move around as fast as I did, but I'm still working eight, nine, 10 hours a day, six days a week. If you love what you do, it really isn't work." I wish all could love their work in that way. Those of us who work with wood and with our hands are very lucky. Could his pleasure have had something to do with his hands? 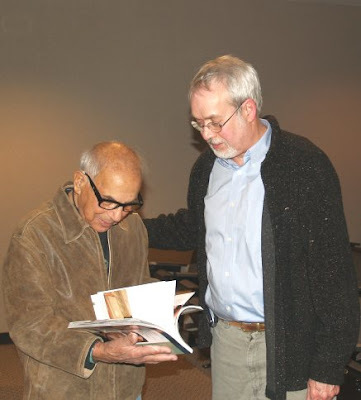 I had the pleasure of meeting Sam in the fall of 2007 and gave him a copy of my book Basic Box Making. 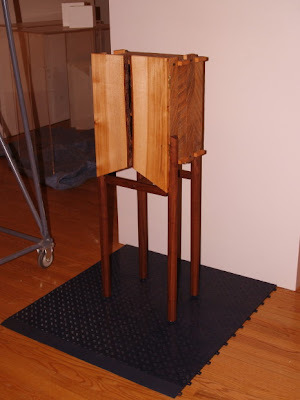 Sam Maloof was an incredible inspiration for thousands of woodworkers and will be missed. "I taught briefly in a public high school and would have loved to have set up a Ritalin fogger in my classroom. It is a rare person, male or female, who is naturally inclined to sit still for 17 years in school, and then indefinitely at work." I have had a conversation with Mr. Crawford and he is making an effort to set things right. He posted a note to his website, along with a link to this blog, and arranged that the New York Times article provide a link to the Wisdom of the Hands. One of the ideas from Malcolm Gladwell's Outliers is that success often comes from the outlier and I want to explore for a moment what this means in relation to crafts and originality. 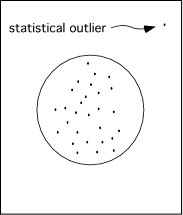 The outlier in statistics is the one outside the statistical norm, in contrast to those fitting neatly in the circle at left. There is a natural compulsion to do the same things as those around you. It is comfortable and offers predictable results. You want to fit in, to be able to discuss the same ball games and the events that took place last night at the club. Being creative requires an interesting relationship between being an outlier and simultaneously being part of a community. Originality requires you to step outside culture and norm for the creative work and then to return to share with others. You can see that spending 10,000 hours in practice of something unique isolates you from many of the social activities that dominate the consciousness of your would-have-been peers. There is risk. You can be so far out that others may have no sense of relationship to what you have discovered. Or, for a variety of reasons, what you do may just not work. But there are also rewards. There is deep satisfaction in discovering things on your own and then sharing what you have learned with others. Being a craftsman in America is outside the circle. And yet it is within another circle. While looking at the culture at large, you find very few making their livings by making things anymore. And yet, there are small communities like Eureka Springs in which outliers have banded together to share and encourage artistry and craftsmanship. Eureka Springs is sometimes called the "place where misfits fit." We are a community of outliers, exploring and sometimes expanding the limits of creativity and culture. Most of those who offer something unique to human culture will feel at times that they are outsiders, geeks, nerds, or whatever the current term may be. You might just as easily say craftsman. It is the role of the outlier to provide the momentum and direction to human culture. Welcome to the Clear Spring School 2009 commencement. We are here to celebrate the successful completion of a 4 year course of Study at the Clear Spring High School, and we are all gathered here also to wish the future success to our graduates. I think it is reasonable at this time to ask the question, what is success? I have been reading a few books lately that are related. One is Malcolm Gladwell’s, Outliers, The Story of Success which explores the success of a number of world renown individuals, another is Richard Sennett’s the Craftsman and two others are by author Illustrator Chris Monroe and are called Monkey with a Tool Belt and Monkey with a Tool Belt and the Noisy Problem. These may seem an odd collection of books. Sennett’s Craftsman and Gladwell’s Outliers have a simple thing in common. Both mention what has become known as the 10,000 hour rule... that it takes approximately 10,000 hours of practice to get really good at something, to become world class in skill and professional understanding. As an example, offered in Outliers, Bill Gates had logged nearly 10,000 hours of programming time before he dropped out of Harvard to found his company Microsoft. In the case of the Beatles, over a thousand performances in clubs in Hamburg, Germany provided the necessary practice time before their introduction on the world stage. One observer noted, “They were no good onstage when they went there and they were very good when they came back.” Now, here’s the math... you apply yourself to something for 40 hours per week and for 50 weeks per year and that takes 5 years to equal 10,000 hours. That’s a pretty big commitment of time. And or course it makes a difference whether or not the commitment is made to something worthwhile. You could, if you wanted, spend 10,000 hours watching the Simpsons, (here I’m not offering a suggestion) have Bart’s every word memorized by heart and have little new meaning to share with others. Richard Sennett’s book is about Craftsmanship, rather than success but offers a bit more understanding of what success really is and what gaining it really requires. Whether working in wood, writing words on paper, logging lines of code or shaping musical notes to travel through the air into the ears and hearts of others, practice of craftsmanship involves a constant dialog between success and failure, testing what works against what won’t... finding a balance that leads you onward toward new development and growth. It is a matter of testing things. They either work and work well or they don’t. If we were never to risk failure, success would never come. Success and failure are inseparably entwined in the exercise of skill. And so, success is really a small thing that is best measured and observed moment by moment. 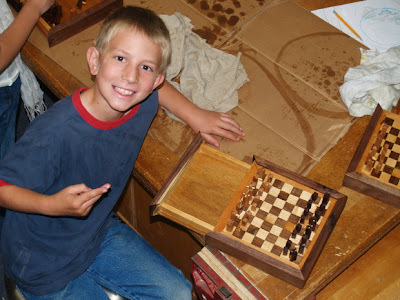 As parents and teachers, we might feel inclined to offer our children and students the perfectly paved path to success with a big capital S, but to do so would deprive them of something very important, that of imagining and creating a future of their own crafted of all those small successes involved in the development of craftsmanship. Worse, it would deprive them of the rewards of self-satisfaction and confidence that arise facing obstacles on their own and of their own making. Finnish Neurophysiologist Matti Berström notes that what he calls the black game and white game are both required in raising children. The white game he describes as the game parents and teachers want children to play for reasons of their own... the rules of the white game are established by the preceding generations and based on assumptions from the past. The black game is the seat of the pants game in which the rules are made up as kids go along. In the black game, limits are pushed and tested, mistakes are made, and risks and failure are as just as important as safety and success. Berström notes that human culture must arise anew in each generation and that the black game is as essential to each generation as those values the preceding generations would wish to impart. The black game prepares our children for the future that those of previous generations cannot imagine. Monkey with a Tool Belt and Monkey with a Tool belt and the Noisy Problem are intended for children from 3 to 10 years old and offer some important life lessons for us all. The Monkey wearing his tool belt at all times, even to bed, goes through life in his small community solving problems, fixing things and making life better for others with his imaginative and always handy tools. You may be able to guess that of these books, Monkey with a Tool Belt books are my favorites. In Outliers, Gladwell’s examples of success are big names like Bill Gates, the Beatles and Yo Yo Ma, but I suggest that the real meaning of success is not often found on the world stage or national arena, but within small communities in which we, like Monkey with a tool belt spend thousands of hours making life better for each other. All these books, Outliers, the Craftsman, and Monkey with a Tool Belt express the important role of community in the individual’s attainment of success. In Outliers, we learn that Bill Gates commitment of thousands of hours in programming time was made possible by his attending an independent school with unprecedented access to one of the world’s most advanced computer networks. In Monkey with a Tool Belt, nothing brings greater joy than to have fixed things or made things, improving the quality of life for others. And so, I have wishes for the graduating class of 2009. I wish you small failures in equal measure with small successes that drive you on to serve and be served, forming your very special place within community. If you happen to spend 10,000 hours at something, may it be a commitment that imparts great meaning to your life, and may your success be measured in things you have solved, fixed, improved and made better for others and yourself. Tonight I am the speaker at the Clear Spring High School commencement, so I am working on a very short speech. This afternoon we applied the Danish oil finish to the covers for Pete's table of elements. While this project was one started by the high school chemistry class, our enthusiastic 7th and 8th graders brought it to a successful conclusion. 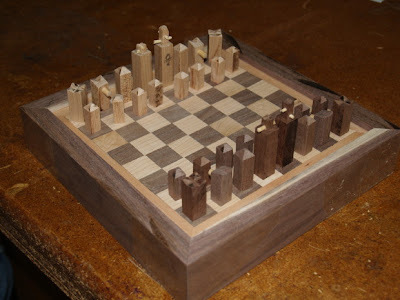 Today with the 5th and 6th grade class we finished the chess sets. The kids were very pleased with the results. A couple years ago when I was visiting my mother she asked, "Do you want those old shelves you made in junior high?" She had stored them in the basement from when I was in 7th grade. They brought back a flood of memories. They were the last project of the school year and I remember being in a rush to finish. When I was cutting out the shape with a coping saw, I noticed I was getting off the line and felt bad for a minute, but I looked over at my neighbor who was drifting even more widely from the line. "I'm not doing THAT bad," I remember thinking. As I drove in the nails to hold it together, one split the shelf as you can see in the photo above. I showed it to the teacher hoping he could fix it or something. "It will be OK," he told me, "You've done a good job." I was crushed that my shelves weren't perfect, but since then I've learned that very little from the hands of man ever is. If it were perfect, we wouldn't have the same impulse to keep trying again and again and we would miss out on so much fun. We were in the same kind of rush today in the woodshop as we finished projects left over from the year, bringing a year of woodworking to a successful conclusion. The kids are all excited about coming back next year. Do you have any old school projects to share? Send me photos and I will post them in the blog. The cultivation of Will is a definite aim of Handicraft teaching. Pupils are practiced in overcoming difficulties, and, consequently, the long-continued exertion of Will power develops a tenacity of purpose which manifest itself in perseverance in all School work, and later in life's work. In Manual training a child has to reach an end some distance off--the production of a perfect model. The attainment of this end requires patient, persistent, organised effort. In character formation Handicraft is a powerful instrument. It encourages concentration of attention and strengthens patience, two very necessary qualities if success in any work is to be achieved. Furthermore, educational handwork gives delight, and this is a direct gain leading to satisfactory results. Pupils are sure to become diligent when work appeals to their interest to such a remarkable degree as experience shows is the case with all forms of manual training. Individuality is revealed, and this becomes an index of character. There is a fine moral training in aiming at a true production; no scamping over work, no equivocation, no evasion of faults, for these are discernible in a fixed form. Perhaps the main advantage from the character-formative aspect is gained from the fact that a child sees his or her own progress, and can measure the resulting success. In other subjects the pupils must await the teacher' verdict to know, for example;, if an arithmetical problem has been correctly solved, or a passage in Latin or French correctly translated, but in manual work the pupil sees at once, to a certain extent, whether the model is a true reproduction of a given model, or whether it is a correct representation in the concrete of the drawing placed before him. 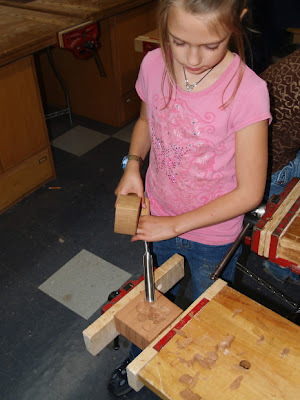 Today in the Clear Spring School wood shop, we have had a playday with kids making projects of their own design, but relying on my assistant Bob and I to provide tools, materials and technical assistance. The kids really love the opportunity to be creative. Anna and Tara made tables and Anna says, she is going to keep on making tables all her life. She described to me the big dining table she will make when she is 12. 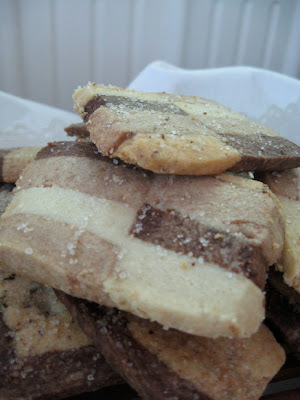 Jane Tucker made cookies for the event based on my technique for making inlay. They are not only as beautiful as real wood, they taste better, too. 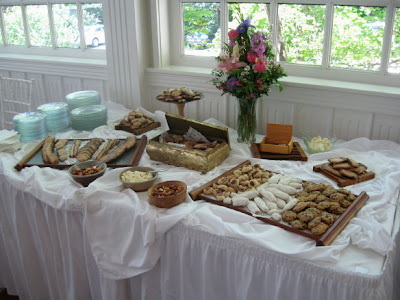 If you look carefully in the photos below, you will see cookies displayed on serving pieces that I and some of my students at Clear Spring School made in years past. Those lacking skill seek scale in substitution. As we decline as a species in ability to shape things skillfully with our hands, the human ego seeks other outlets; developments of massive scale and proportion. Throughout the world, people are striving as we once did to produce the highest buildings and largest developments. On the personal scale men and women sought the purchase of grand estates to fill emptiness in their lives, the hollow space left when there is failure in the creative engagement of the hands. We call that being out of touch. Our being out of touch has disastrous consequences for our planet. The remedy is simple. Plant, make, cook, garden, sew, care, nurse. We find that we are best as shepherds of simple things. 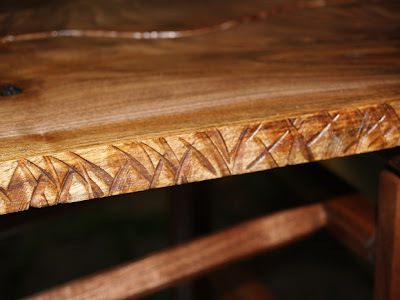 A hand passed across wood discovers texture that is modified and made smooth by touch. In that simple conscious act is the power to reshape the world. Let it be restored and made anew. "I write this in the belief that, for all-round development of the brain, there should be in elementary and secondary education much more training of the hand, and of the power of expression through the hand, than is customary in the too bookish tradition which has come down to us from classical humanism. Such a subject as history is too apt to pass without challenge into the circle of those subjects which are taught out of books and from a literary point of view. We have to claim it as falling into the scientific division of the course not less than into that of the humanities. And there is need in the teaching of it for the use of the hand and of the constructive powers. From this point of view, handwork in the elementary school is not such a subject by itself as a form of expression ancillary to several branches of the curriculum, namely elementary science, geometry, geography, and history." In the photo below you can see the almost completed air control box for shifting the dust collector in my shop from the planer to the table saw. By cutting a small gap in the side of a pipe, its diameter can be reduced to fit inside a pipe of the same size, allowing for ease in the making of parts. You can see the inside of the control box in yesterday's post. 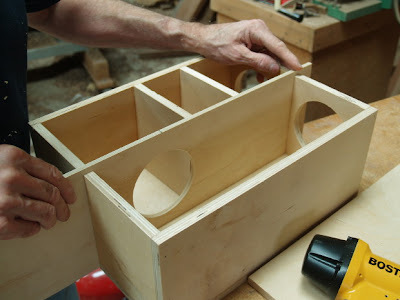 I am making an air controller for my dust collection, which allows me to switch from the planer to the table saw or turn the air flow from both off. It is a simple box with an internal divider and a sliding control. In the photos you can see positions, one, two (off) and three. It is a simple device that should save me countless steps to the back side of the equipment to switch hoses. It should make the shop neater, and it will definitely cut down the time spent on my knees while hooking things up. We had a successful White Street Art Walk last night. Weather was beautiful and the crowds were having great fun, drinking a bit and buying art. Tomorrow I have the ALT reception and will make a ten minute talk about my work, those who have enabled it, and the Wisdom of the Hands. Making the dust collector control box was a great diversion, something I've been needing to make and I always feel much better when I get to make something useful. 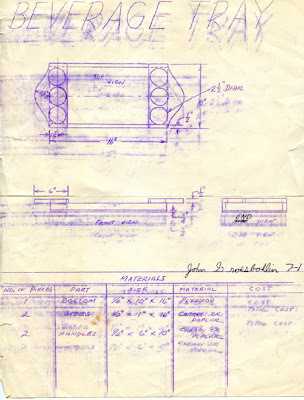 John Grossbohlin sent this copy of an old mimeograph from his 7th grade shop class. Anyone remember those days? It is amazing that parents would save such things, and now with the "paperless" office, schools and homes are swamped with the clutter of paper products. John plans to make some trays with his sons in this same design, even though with their experience, this project may be almost too easy for them. On the radio program Car Talk this morning, Tom and Ray talked about how parents try to eliminate the risk of failure from their children's lives and create even bigger problems... a complete lack of confidence. Way to go Tom and Ray! It raises the question, would we like schools where students and teachers actually learn, where children's interests and passion for learning are aroused? 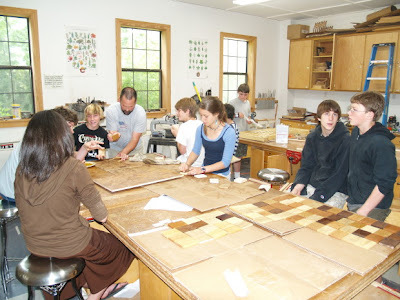 We will have to take a few chances for that to happen and one risk that I will propose is woodworking for all kids, pre-school through 12th grades. 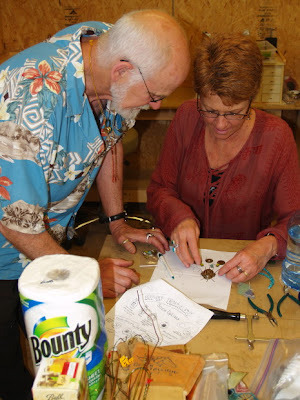 World renown jeweler and craft artist Bob Ebendorf is teaching at ESSA this weekend. 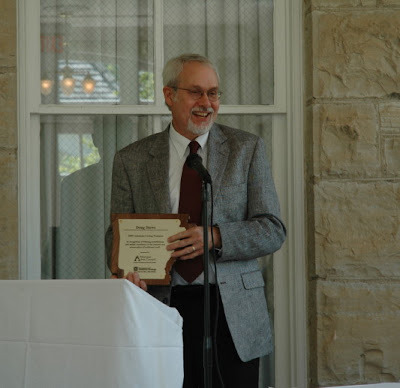 You can read about his class and his career on the Eureka Springs School of the Arts blog. 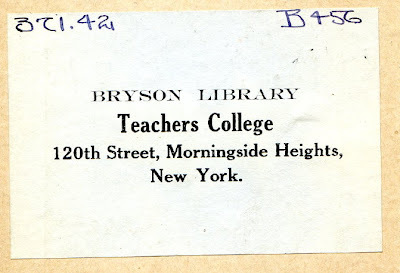 In addition, the blog has published an interview with me at this address. The following is from T.W. Berry, Educational Handcraft, 1912, on the relationship between Froebel's Kindergarten and the use of manual training movement in general education. In Freobel's words, "the purpose of teaching is to bring ever more out of man rather than to put more and more into him." If it is good--and it is never now contested--to consider child-nature in the Infant Schools; to aim at an all-round development of the physical, mental, and moral nature of the child; to train the sense by active participation in examination and experiment; to provide a variety of well graded and carefully considered educational exercises in clay modeling, colour work, stick-laying, drawing, and other exercises of like nature; to train the imagination and develop the powers of language by imitative plays; by geographical scenes; by nature study on Froebellian lines--surely it is not too much to ask that this interesting, instructive, educative, natural plan shall not be completely taken from the child simply because he or she as attained the age of six or seven years, and has consequently been transferred to the upper department. This afternoon, I will be at the White Street Art Walk, displaying my work to hundreds of visitors and residents of Eureka Springs. I hope to sell a few things, too. 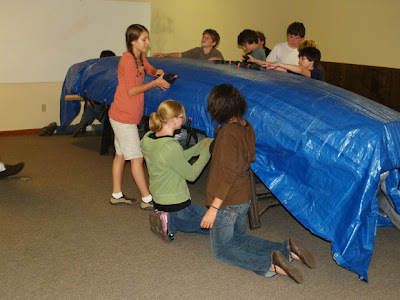 We had a 50 percent chance of thunderstorms but chose to launch despite the chance of bad weather, and despite the conviction among some students that the blue whale would sink on its maiden voyage. 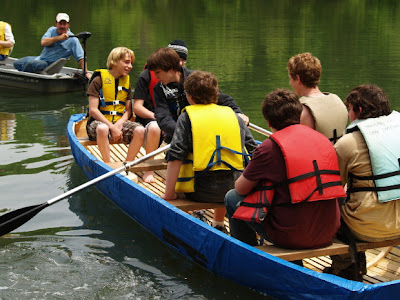 As you can see, it floated like a charm, even when loaded with 7 high school and middle school students. It was very nice that some parents turned out to watch and the kindergarten class from Clear Spring School, too, shown in the last photo below. The press came too, and an article about the maiden voyage of the blue whale will be featured in the Lovely County Citizen. 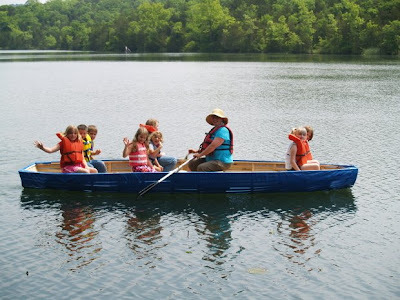 My sincere thanks are offered to the Eureka Springs Parks and Recreation Commission for the loan of a beautiful Lake Leatherwood, as well as oars and life jackets. 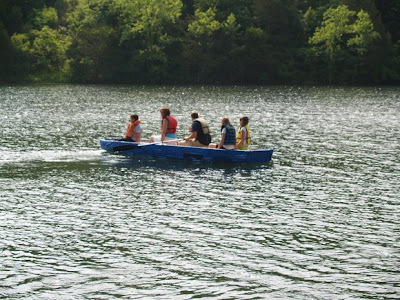 Special thanks, too to Daren Guillory, Clear Spring School parent for transportation of the blue whale to the lake for its launch. All were excited and pleased to test the results of our boat building efforts. 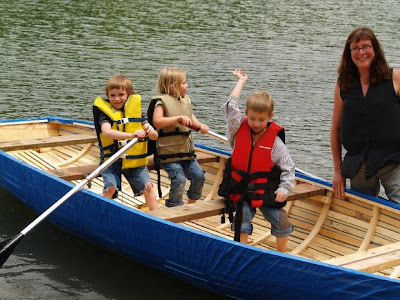 The kindergarten students felt left out, not getting to ride in the boat, we gave them a chance to have their pictures taken at the oars while the boat was safely secured at shore. Now that the excitement of the launch is over, I turn my attention to the White Street Art Walk, which happens here in Eureka Springs tomorrow night. Check back tomorrow for the launch of the Blue Whale. 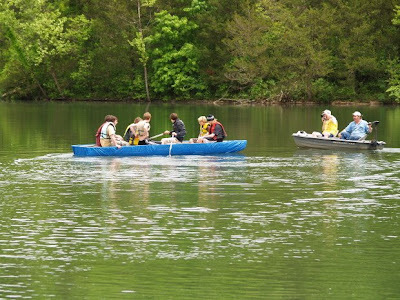 We are borrowing oars and life jackets at Lake Leatherwood, and the students are getting their boating permission slips signed tonight. I have a roll of super gorilla duct tape to fix leaks. We are all excited to get the boat in the water. William Ng School of Fine Woodworking still has some spaces available for my class held from June 8-12 in Anaheim, California. You can sign up here. This is also your last day to register to win one of my boxes from the Design Blog List. You can register to win by commenting or by twitter. Your choice. It has been an interesting contest and has drawn a great deal of attention to the work displayed at my etsy store. 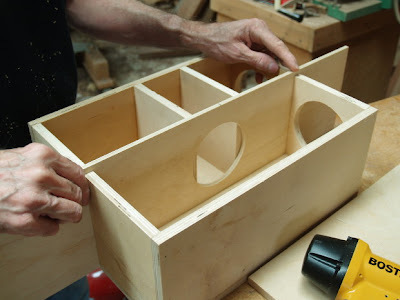 Now in Fine Woodworking Editor's Notebook. Check out the Institute for Backyard Studies, an Australian site for the making of things and seat of the pants engineering. The site is the brainchild of Mark Thomson, originator of the Blokes and Sheds Series, and Makers, Breakers and Fixers. Institute for Backyard Studies is a fun site with great links and dedicated to hands-on ingenuity. This is a link to an interview with NPR reporter Jacqueline Froelich in 2003 when she visited me in my shop. The program is called Ozarks at Large. The walnut bench is finished and I like the way the textured edge turned out. This was done with an angle grinder and sanding disk with the edge of the disk bounced into the wood in a haphazard, random fashion. It is a great way to restore a bark like natural edge where an edge has been cut with the saw. The edge shown below was cut straight on the table saw and then restored to a more natural look. What do you think? Is it a successful technique? 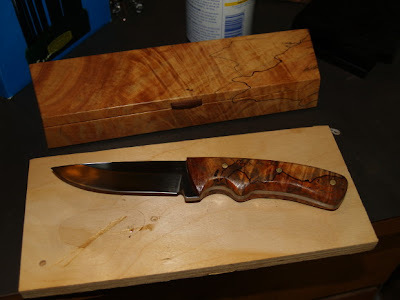 I made a spalted handled knife to fit the spalted knife box I made for an article in Woodcraft Magazine a couple years ago. I am on a push to reduce excess inventory and finish off things that have been lingering too long in the shop. The almost finished spalted knife is shown with the box below and will be available for sale at the White Street Art Walk on Friday, May 15, here in Eureka Springs. 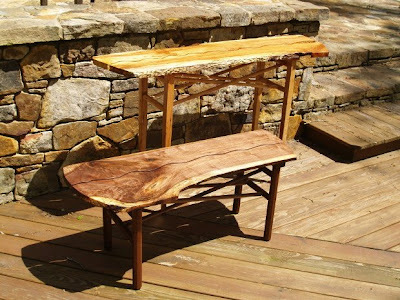 I just finished a table and bench in the new series using natural edges with contemporary base. 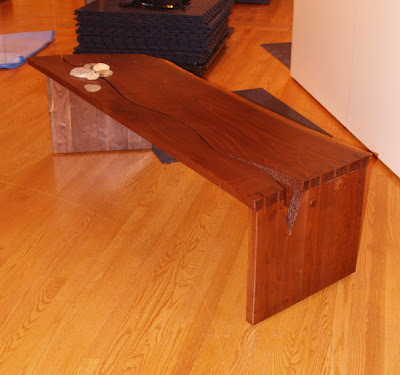 The bench is all walnut and the table sugar maple with curly hard maple base. You may wonder about why we have a class system based on whether or not a man or woman gets dirty at work, or whether a man or woman works with skilled hands rather than with head alone. A friend noted that those who work sitting down get paid more than those who work standing up, and another noted that those who shower in the morning get better pay and higher status than those who shower at night. While the ancient Greeks were not the origin of class discrimination, Plato and Socrates did their best to sustain it through their concept Banausos. They used the term banausic for the low-cast, cringing souls involved in the making of things. In the Laws, the term ‘banausia’ is used to describe the depraved state of a man who makes money by means other than the hereditary possession of land. It is way past time for all that to stop. There is no better way to develop honor, and moral integrity serving true democracy than by encouraging the growth of skilled craftsmanship and society-wide respect for it. 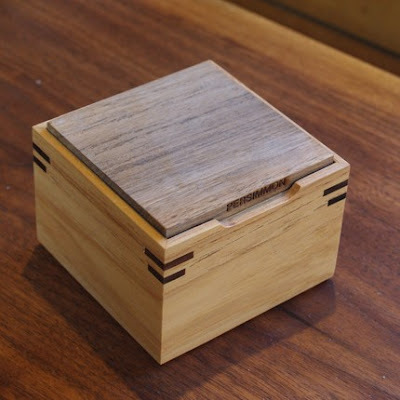 Design Blog List is giving away a Doug Stowe Box to generate interest in their site. You just need to comment or respond via twitter to enter. 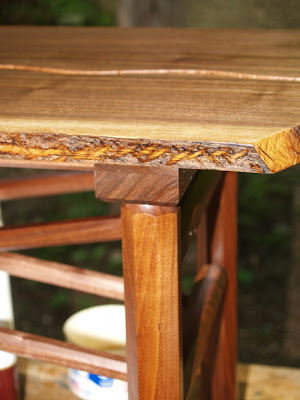 The design Blog list is created by Mitch Roberson, furniture maker who also blogs at Furnitude. Today I am making a walnut bench in a new design derived from the rustic/contemporary hall tables I've made of late. I am also finishing a maple table with curly maple base. Both of these have presented some challenges related to some warp in the materials. 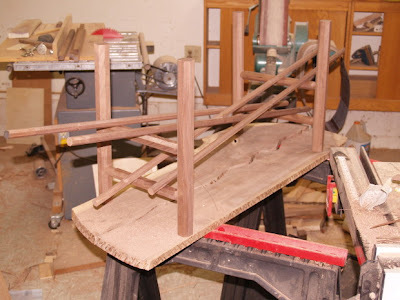 As you can see in the photo, the walnut bench is being assembled using wedges to lock tenons. It may be overkill in terms of strength but also allows for a bit of variation that resulted from the forming of the tenons. Next time I may use my Shopsmith as a horizontal borer to make my tenons more precise than what I can do with a hand held electric drill. I don't know haw many have such wonderful opportunities to learn from experience. It is what I would wish for each man, woman and child... to learn the soft, manageable daily lessons of craftsmanship rather than those catastrophic things that happen when we get completely out of touch. "Schools should appreciate forms of intelligence that are not linguistic. Arts should not be dropped from any school's curriculum -- the teaching of fine arts and/or musical intelligences develop strengths not measured on an IQ test. Spatial intelligence, while highly prized by the economy, is not really taught in schools until college level, and those students with strong spatial intelligence can easily become school dropouts because they never encounter their strengths in the classroom." In the meantime the blue whale is complete except for oars and oarlocks. I will try to find a donated set to attach on Monday. A friend, Elliot Washor is co-director of the the Big Picture Co. and has a new blog that should be interesting to followers of the Wisdom of the Hands. tinking and thinking is about that connection between doing and the development of intellect. As you may know and as I have worked to inform, fundamental educational theory from the earliest days recognized that academic interests arise from activity, what Elliot so aptly names tinking. To push academics that do not arise from learning activity puts the cart before the horse, and many children are alienated and diminished if not completely squashed flat by the experience. Anyway, check out Elliot's new blog. Good stuff. 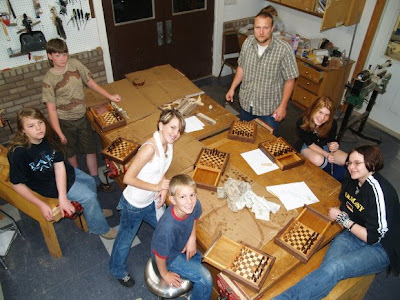 You can see that our fifth and sixth grade chess sets are almost complete. The Blue Whale is almost complete, having received its skin of blue tarp today as you can see in the photos above and below. Take a coffee can, and a piece of paper. Draw a constellation on the paper and tape the paper to the can. 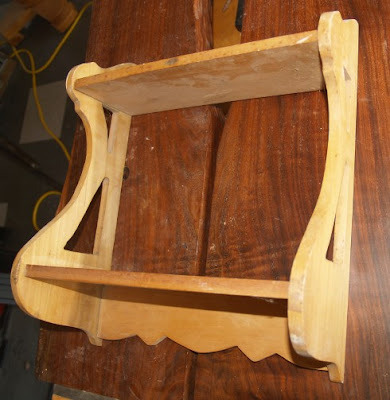 Then mount a piece of wood in the vise so the can can slide over it. Use a nail to poke through the can into the board. When you wiggle the nail back out, you have left a star. Next mark a piece of wood at its center point. You do this with a pencil and ruler. 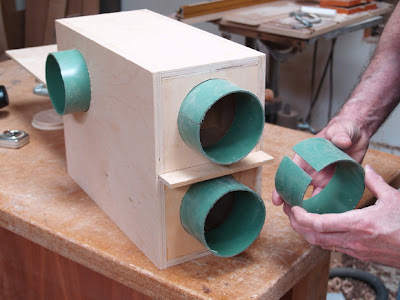 Use a circle cutter in the drill press to drill part way, making a recess for the can to fit. Then, drill a hole for a tea candle to fit. We blackened the cans with a propane torch. This was a fun project completed as part of the kids' study of space in 3rd and 4ht grades. The first and second grade students had a free day to work on projects of their own designs and from their own imaginations. Today in the Clear Spring School wood shop, the 3rd and 4th grade students will be making lanterns to display the constellations. 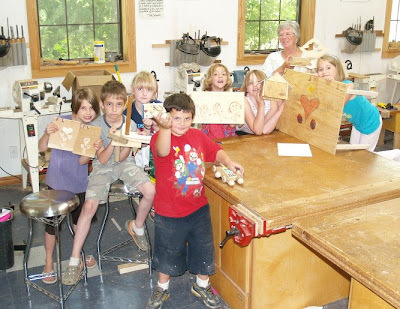 The first and second grade students will have a free day to make things of their own design. 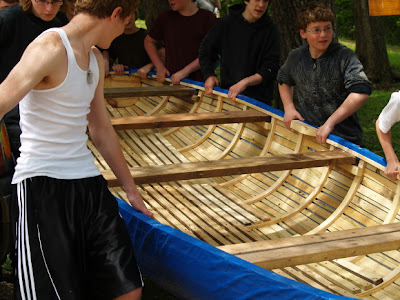 The high school students will be adding the skin to the boat. It will be a busy day. It is interesting that wood shop and manual training have long been seen as an educational tool to address the needs of the poor, mentally deficient and uncouth. Yes, it has benefit for all children. But to think that its benefits are only for those children of the poor, the mentally deficient and uncouth is a tragic misperception that harms our culture and those very normal children who would find joy and meaning in its creative opportunity. This morning in the woodshop, I started a new intern learning about the woodworking business and I worked on a new walnut bench based on my contemporary rustic table designs. "It would not be amiss, if before young Scholars be far ingag'd in the beaten tracks of the Scholes, the Mysteries of Manual Arts, the names of their Instruments, the secrets of the Operations, the effects of Natural causes... were propos'd to be the subjects of their first thoughts and observations." "I will venture to propose to the consideration of wise men, whether this way of Teaching by Practice and Experiments, would not at least be as beneficial as the other by Universal Rules? Whether it were not as profitable to apply the eyes, and the hands of Children, to see and to touch all the several kinds of sensible things, as to oblige them to learn and remember the difficult Doctrines of general Arts? In a word, Whether a Mechanical Education would not excel the Methodical?" I see no more reason why the sordidness of some workmen should be the cause of contempt upon Manual Operations than that the excellent Invention of a Mill should be dspis'd because a blind Horse Draws in it. And though the Mechanicks be by some accounted ignoble and scandalous; yet it is a very well known, that many Gentlemen in this Nation of good Rank and high Quality are conversant in Handy-Works: And other Nations exceed us in numbers of such. How pleasant and healthy this their Divertion is, their Minds and Bodyes find; and how harmless and Honest all sober men may judge? Later in his "advise" Sir William Petty says that just as it would be more profitable for boys to spend ten or twelve years in the study of things and his proposed "Book of Trades," which he describes, than in a "rabble of words," so it would be easier and pleasanter for them as well as more in accord with their natural "propensions." For children "delight in drums, pipes, fiddles, guns made of elder-sticks and bellows noses, piped keys, etc. and in painting flags and ensigns with elder berries and corn poppy, making ships with paper, and setting even nut-shells a swimming, handling the tools of workmen as soon as they turn their backs, and trying to work themselves, fishing, fowling, hunting, setting springes and traps for birds, and other animals, making pictures, in their writing books, making tops, gigs, and whiligigs, quilting balls, practicing divers jugling tricks with cards, etc., and million more besides." He gives a similar list of activities that are interesting to girls and then adds; "By all which it is most evident, that children do most naturally delight in things, and are most capable of learning them, having quick sense to receive them and unpreoccupied memories to retain them. As for other things whereunto they are now-a-days set, they are altogether unfit, for want of judgement, which is but weak in them, and also for want of will, which is sufficiently seen both by what we have said before, the the difficulty in keeping them at school, and the punishment they will endure rather than be altogether debarred from the pleasure which they take in things. "Theory," Says Vives, is "easy and short, but has not result other than the gratification that it affords. Practice, on the other hand, is difficult and prolix, but is of immense utility." Since this is so, we should diligently seek out a method by which the young may be easily led to the practical application of natural forces, which is to be found in the arts." Artisans do not detain their apprentices with theories, but set them to do practical work at an early stage; thus they learn to forge by forging, to carve by carving, to paint by painting, to dance by dancing. In schools, therefore, let the students learn to write by writing, to talk by talking, to sing by singing, and to reason by reasoning. In this way schools will become workshops humming with work, and students whose efforts prove successful will experience the truth of the prover: "We give form to ourselves and to our materials at the same time." "...in a state of society, where he must be necessarily maintained at the expense of the community, he certainly owes the state so much labour as will pay for his subsistence; and this without exception to rank or persons. To labour, then, is the indispensible duty of social or political man. Rich or poor, strong or weak, every idle citizen is a knave..."
"My child learn a trade! make my son a mechanic! consider, sir, what you advise--I do madam, I consider this matter better than you, who would reduce your child to the necessity of being a lord, a marquis, or a prince, or perhaps one day or other to be less than nothing. I am desirous of investing him with a title that cannot be taken from him, that will in all times and places command respect; and, I can tell you, what every you may think of it, he will have fewer equals in this rank than in what he may derive from you. The letter destroys and the spirit maketh alive. I would not have him learn a trade, merely for the sake of knowing how to exercise it, but that he may overcome the prejudices usually conceived against it. You will never be reduced, you say, to work for your bread. So much the worse for you; I say, so much the worse. But, no matter; if you labour not through necessity, do it for reputation. Stoop to the situation of an artisan that you may raise yourself above your own. To make fortune subservient to your will, you must begin by rendering yourself independent. To triumph in the opinion of the world, you must begin by despising that opinion." Today at Books in Bloom, I sold a few books, not many. As I said yesterday, people generally buy books for entertainment and distraction and except for those with very special interests, avoid books that demand something from them, like growth or skill. I was the last speaker of the day, and either fortunately, or unfortunately, depending on perspective, I had no one left in the audience, and managed to skate off with some clean-up and hauling. Those duties come with the territory of being married to the librarian co-director of the event. This all means that those of you who read the post below are the only ones who have the opportunity to benefit from what ever insight I was intended to impart. Depending on your perspective, that is either fortunate or not. 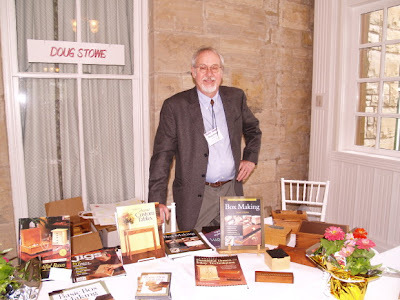 Selling books that require deeper commitment on the part of the reader is a challenge in a general audience, but I did have a couple customers who knew my work from woodworking catalogs and Fine Woodworking magazine and were pleased to find me. Just in case you wonder if I was really there, and not just making things up like so many writers, I've posted a photo below. We all know that life in the 21st century is busy. There are so many choices of entertainment and distraction that it is hard to get any work done. And of course there is the Internet, a powerful tool that provides a sense that the whole world is right at our fingertips. But when we go off line, the same drippy faucet is dripping its drip, the deck is in dire need of refinishing, and there are countless other things that need fixing or making or are just about to break. There are great writers that we all know and love who have the power to whisp us away through time and space, distracting us from concerns, and placing our consciousness outside our own bodies, into the lives of created characters far removed from the real situations of our own lives. Those are the writers that get the big bucks… the ones who entertain and distract. Their words carry us into feeling states from which we ultimately reawaken to lives unchanged. How-to really has to do with the hands, and here are three things that I’ve noticed. The first is that the use of the hands makes us smarter. This is an idea proven by modern research as well as being observed by scientists and educators as long as there has been science and education. Yuo can even test it for yourself. Secondly, the use of the hands makes us feel better. You all remember Cinderella, the wicked stepmother and ugly stepsisters, and you may recall in the Disney version, Cinderella singing joyously in the garden and kitchen as she served her unappreciative and demanding family. The simple untold story is that that is what happens when you are aligned with the universe. Neurohormones triggered by engagement in creative activities brings forth a sense of joy. That joy is noticed by others. It may make them jealous. You noticed that in the Cinderella story, there were magical things happening with fairy godmothers, pumpkins, mice and the like. We often use magical beings as a means through which to explain inexplicable phenomenon. The most important part of the Cinderella story is not something that is told, but it is something you can discover for yourself. This isn't just something I'm making up. Check out Kelly Lambert's theory of "effort driven rewards," and you will find that joy arises from the simple tasks we might be twisted toward believing are beneath our dignity. While the stepmother and stepsisters were poisoned by self-importance, Cinderella worked with her hands and expressed joy. Here in Eureka Springs we live in a community of artists and craftsmen, and each and every one will tell you that they feel better when they are engaged in their work. But you won’t have to take their word for it. This is something you can test for yourself in the garden or in the kitchen, without loading up on new tools, or having a wood shop. How-to writers carry a great deal of power in our own hands. We, more than most, know the wonders of our own creativity. We, more than most know the forces and means inherent in the human soul to improve the reality of the day to day and the here and now. So, I want to point out the value of who we are and what we really do. We empower. In the face of a consumer culture with the masses driven to consume we inform and instruct: how-to, why-to, encouraging others to build and make better. Perhaps some of us may feel compelled by the unrelenting forces of fantasy to write the great novel instead, but perhaps we should remember there is no more important calling for today’s age than that of the how-to writer. Being a how-to writer is very much like being any other kind of writer except for two very important things. First is that you have to have some level of non-literary skill and direct experience in what you are writing about. You don’t have to be the very best in the world at something, but you do need to know the processes well enough to explain things clearly because what you write will be tested in the hands of those who are tempted to follow your instructions. I had an important realization that everything I do is narrative. In my case, I use a chisel to cut wood. The wood records the motions of the hand and arm, the shape and size of the chisel, the quality of its cutting edge and the amount of force applied. Once you come to the awareness that you, in everything you do, use a variety of tools and materials to tell the story your own life, then you find that it is easy to transition from narration in wood or whatever other material you choose, to documenting your work in photographs or video, and in written word. Adding your own editorial component, you then ask, “Is what I do of compelling interest?” If you come up with the answer, “No.” Then it is time to make adjustments in what you make or even in how you live your life. I want to talk for just a few minutes about my own processes. In the selection of what I am going to write about, I ask myself, "Is there anything particularly interesting about this process." If the answer is yes, then I gather the materials and begin work. Sometimes I’ll clear a project first with an editor from one of the magazines I work with before I begin. I take photos of each and every step, and for me, the photography is crucial to both keeping my narrative in order and reminding me of each step as I am writing so that nothing is overlooked. I use a digital camera on a tripod and use the self-timer to control the shutter. For very best lighting, I have the studio well lit with daylight fluorescent bulbs, so that wherever I am shooting, I don’t have to bother setting up lights. So how to get really started? Where can you test and develop your how-to writing skills? Fortunately these days, you don’t have to be discovered by a national magazine. There are on-line newsgroups and forums where you can share your tips and processes. In addition, Google has set up a new home for how-to knowledge. Called knols, for discrete units of knowledge, these make your first efforts at writing how-to easy and accessible to others by following a simple template. You can insert your photos, texts, step-by-step, slide shows and video. 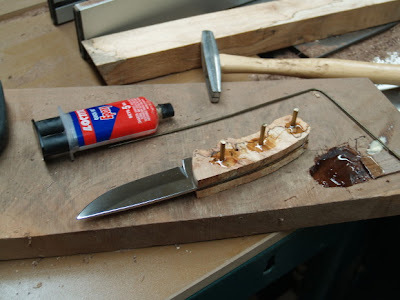 I set up my first knol on the subject of making your own spoon carving knife. And while you don’t get paid directly for writing knols, they can be a way to direct attention to other Internet based content you have created. Best of all, writing knols can provide the experience and feedback required to refine your writing and photographic skills. Now I would like to take a few minutes for questions. 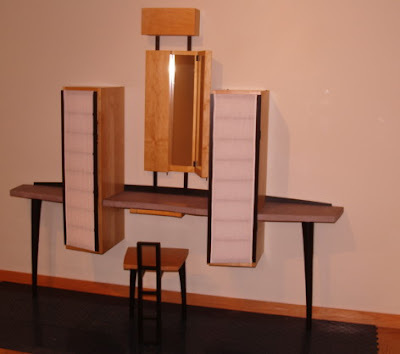 Yesterday I delivered work to the Historic Arkansas Museum for their show of contemporary furniture, Custom by Design, which will be set up from May 15 through January of 2010. In case you are unfamiliar with the Historic Arkansas Museum, it's most notable and most revered object is the original Bowie Knife but it also holds a collection of original buildings from the early days of the founding of Little Rock. As you can see in the photos one exhibit has just been removed to make room for the arrival of our work, and two of my 6 pieces in the exhibit are hunting their temporary homes in the museum. 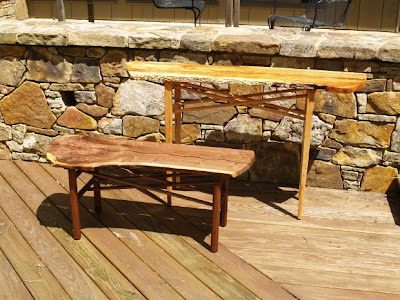 Works by six or seven Arkansas furniture makers will be in the exhibit. A piece by Mia Hall is shown below. I will be set up selling my books and DVD at Books In Bloom tomorrow from noon until 5PM and will give my talk on the "How-to of How-to" at 4:15.